WOW! Wednesdays Green Smoothie Link Up held over 30 delicious smoothie creations and it seems by the comments, tweets and even IG that there are so many more of you participating too!! I'm wondering do you feel any different? Like do you feel healthier by just having one green smoothie? Do feel more energetic? Less hungry? I guess for me, having a smoothie/green smoothie each day definitely makes me feel healthy. It's a healthy choice how could it not?! They do fill me up but are in no way a meal replacement for me. I find them to be super convenient and love adding protein to it for post workout purposes. The whole family enjoys them and I'm thinking about freezing the mix as popsicles for the upcoming weekend. Don't you think that'll work? I'm happy about taking on taking on this 7 day green smoothie. I know my blog is running posts like crazy compared to my normal but this is a good cause and I'm happy to support it and thrilled by each of you who have joined! Our bodies are little machines and we need to fuel them correctly. This is just one way to be sure we're feeding ourselves a healthy treat each day! Keep those recipes coming and keep with the challenge, stay strong through the weekend! We're here for ya!! I'm just now seeing this green smoothie challenge - a little late but oh well! I recently got a ninja blender and have been looking for other smoothie recipes so I'm really excited to try some of yours! Thanks for sharing! I feel healthier for sure!! 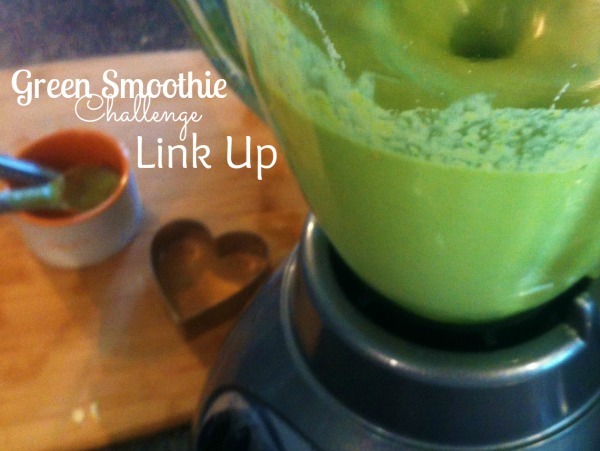 Love your smoothie pic for the link up :). Happy Friday! Me too! I really can feel the energy and the good from the smoothie! It's so simple, healthy and beautiful. Thanks for the challenge! I am actually not used to having this much fruit in my diet (I have to watch for my hypoglycemia), so I am not necessarily feeling better. However, I have discovered some awesome new recipes, am loving the yumminess, and am so happy to get to play along! Woohoo!